You can configure how email is sent. You can choose whether to use your MAPI client, for example, Microsoft Outlook, Outlook Express or Eudora, or an SMTP server. If you choose to use your MAPI email client you don’t need to configure any options as these are set by your email software. If you allow your MAPI client to send your emails it may not send them unless the email client is running. If you choose an SMTP server you need to enter certain information depending upon your host (or ISP). These settings can normally be copied from your existing email client. The settings to copy are those specified in your Outgoing mail server (SMTP). Some ISPs, for example, Freeserve, only allow you to send email from their SMTP server. Some SMTP servers may not use the default port (of 25). Also they may require you to use your given name and password. Below are some examples of values to use for different ISPs. When you send an email you need to identify who the mail is from and a reply address. You can specify the same settings for all Actinic sites or provide different details for each site (that email is sent from). 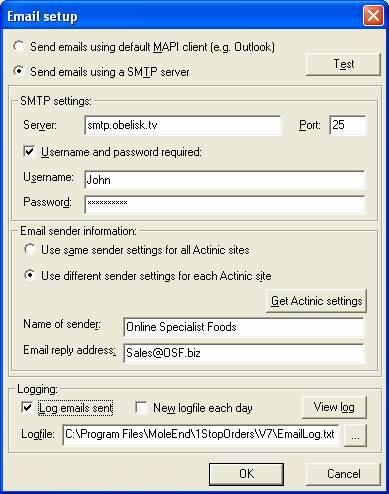 If you are using a different email address for each Actinic site you can retrieve the existing settings by clicking the Get Actinic settings button. You can choose to log details of all emails sent along with any errors found. You can specify a new log for each day or a single combined log with all email information. To view the log click on the View log button. You are given the choice of editor to use for viewing the log information.